Intel’s performance guys have a thing for skulls. They delivered a high-performance, dual-CPU motherboard setup named Skulltrail a few years back. Now they’ve announced the new 730 Series of enthusiast-class SSDs emblazoned with fleshless noggins. Do these drives live up to their “killer” image? The company shipped us a pair of 480GB drives so that we could benchmark them striped as a single volume in RAID 0, which is how a PC enthusiast might deploy them. Theoretically, you should get near twice the performance this way; but since we haven’t tested any other SSDs in tandem, we stuck with one drive for our full benchmarking regimen, ran CrystalDiskMark for the RAID 0 setup, and I got to kick them about at home. Sweet. This job does have its perqs. Alas, the killer image doesn’t quite hold up. The 730 Series SSDs utilize 20nm MLC (multi-level cell) NAND, and their 7mm height means they'll fit in most any notebook or even an all-in-one (provided it can be upgraded), as well as a conventional desktop rig. It uses the Intel PC29AS21CA0 controller, which also powers the Intel 3500- and 3700 Series SSDs that Intel markets to data-center operators. According to Intel, the controller is overclocked by 50 percent, and the NAND bus by 20 percent to substantially increase overall performance. Intel made some noise at its 2013 developers’ conference that it would allow end users to overclock the controller, but decided against it in the end. Alas, the killer image doesn’t quite hold up. The drives are available in 240- and 480GB flavors, priced at $250 and $490 respectively. We tested the 480GB model and it proved to be a good, but not a great performer, ranking 10th out of the 19 drives we’ve tested to date. That said, it does smoke the Intel 335 Series, and the difference between the 1st and 10th-place drives is statistically insignificant once you throw out Plextor’s new PCIe drive and Samsung’s EVO using its Rapid caching software. In this test, we measure the drive's performance reading and writing a 10GB collection of small files and folders. The Intel 730 Series finished in the middle of the pack. By the numbers, the 480GB Series 730 wrote our 10GB mix of files and folders at 469.1MBps and a single 10GB file at 461.9MBps. It read the files and folders at 384.4MBps and the single large file at 454.2MBps. I saw a significant performance jump with two of these drives striped in RAID 0, using Intel Rapid Storage Technology. (Note: PCWorld's benchmarking environment is described at the bottom of this story.) 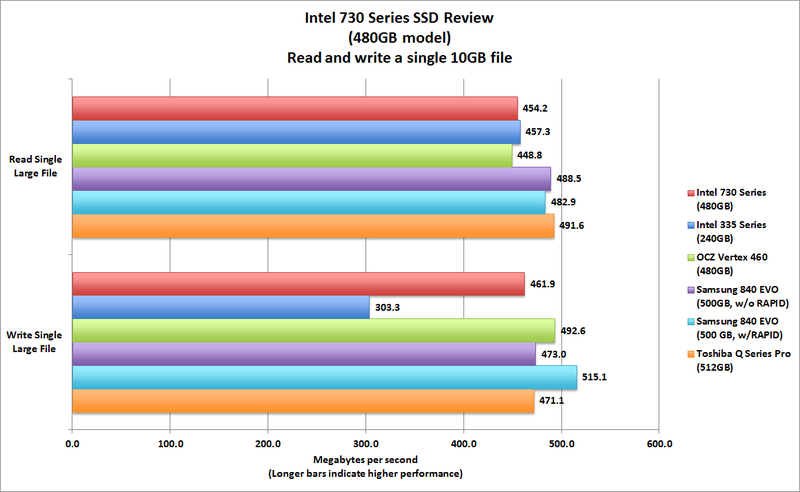 That’s very close to the 100-percent improvement that Intel claims. CrystalDiskMark’s sequential write number jumped from about 460MBps to 800MBps, and the read number went from 470MBps to just over 900MBps. 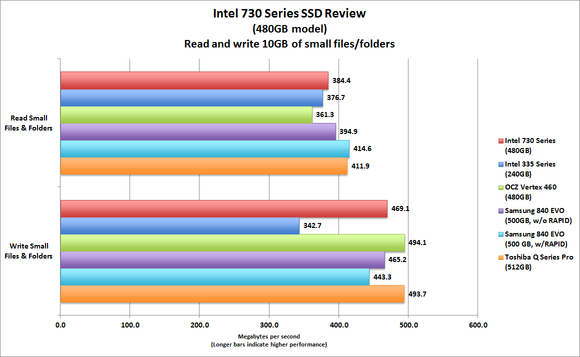 But the performance gains will vary depending on which RAID technology is in use. When I repeated these tests on my own system—a motherboard with an Intel Z77 chipset, an Intel Core i7-3770 CPU, and 8GB DDR3/1600 memory—I saw a performance increase of only about 50MBps. In our second real-world benchmark, we measure how fast the drive can read and write a single 10GB file. Here again, Intel's drive delivered a good performance. But performance is only part of the 730 Series story: Intel talks a great deal about longevity, and the company backs that up with healthy 5-year warranty. You can tell from the capacities—240- and 480GB, versus 256- and 512GB—that a great deal of NAND is devoted to housekeeping and over-provisioning (memory cells set aside to replace bad blocks, or to be swapped with deleted-but-not-erased memory in certain situations). Intel rates both drives at 1.2 million hours mean time between failure, or about 13 years. Looked at another way, the claimed 50GB (240GB model) and 70GB (480GB model) of writes per day works out to roughly 90 to 125 terabytes written under warranty. Those are decent numbers. 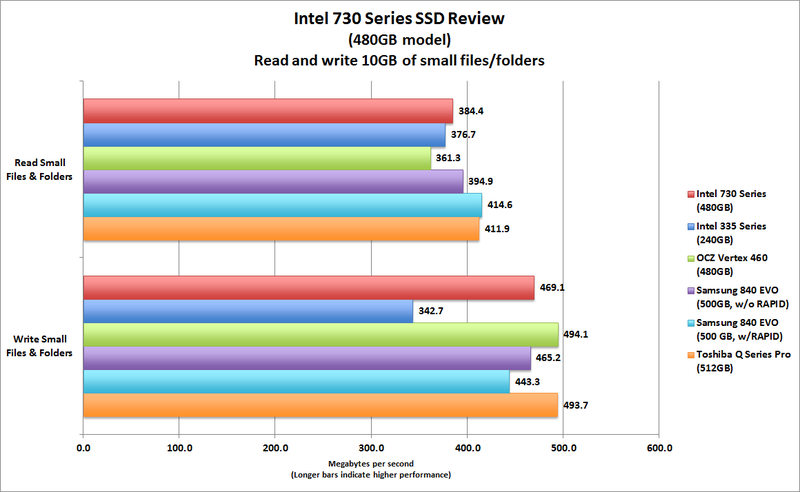 Based on the 480GB model we tested, Intel’s 730 Series SSDs aren’t the absolute fastest solid-state drives you can buy, but they are very solid. The enterprise-class heritage and 5-year warranty are reassuring; and in pairs—coupled with Intel’s Rapid Storage Technology—they make for a very fast storage subsystem. About our test environment: We benchmark hard drives and SSDs using an Asus Z98 Expert motherboard (Intel Z87 chipset) with an Intel Core i7-4770K CPU, 32GB of Corsair Vengeance DDR3/1600 memory, and a 512GB Toshiba Q Series Pro SSD. The operating system is Windows 8.1 Pro. 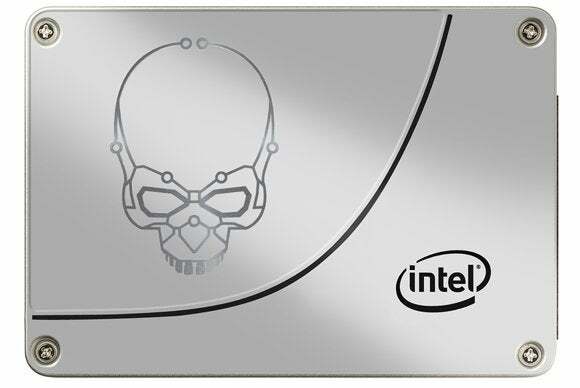 Intel's 730 Series SSD should last a good long while, but don't buy one thinking the skull logo will endow your PC with killer performance.